Renovating the bathroom in your apartment or house isn’t just about increasing the value of your property, it’s about improving your atmosphere, mood and yes! – The quality of your life. With thoughtful consideration about how you actually live in your home, we can help you redesign your bathroom so that one of the most important rooms in your home gives you space, functionality and an uplifting atmosphere. Bathroom design is often overlooked. Considering that most people are rushing around trying to get ready to start their day, a bathroom that makes life easier instead of more challenging can set the entire tone of your day. A typical person spends a good deal of time grooming with various products for teeth, hair, nails, body and face, so ample bathroom storage, electricity, lighting and bathroom fixtures are important factors. The bathroom is usually the first room you enter in the morning and the last before you go to bed at night. Problems with space and stationary elements can sometimes present challenges for a home remodeling project, but we can typically find a solution to most any problem and design the bathroom around your lifestyle. Attending to design details means keeping up with evolving home trends each year. We’ll help you consider new and fresh colors, materials, shapes and patterns for durability and functionality as well as style. Whether you’re looking for a Manhattan renovation that’s contemporary, feminine or masculine themed, globally inspired, traditional or casual – with sustainable materials – we can work with you through every step. From selecting contemporary bathroom faucets, convenient bathroom shelving options, proper installation of vessel sinks, tips for choosing a bathroom mirror and designing true bathroom luxury, Above Remodeling is your complete bathroom renovation team. We’ll take a look at current trends in bathroom fixtures, hardware, vanities, mirror and lighting, as well as the most practical, stylish and sustainable tile, grout and flooring for your preferences, space and budget. 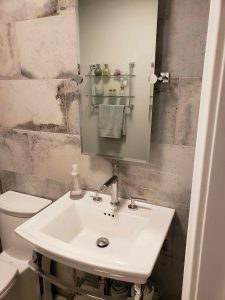 Establishing a budget for your apartment bathroom renovation is key and we can work with you to help you understand remodeling costs, determine what is appropriate for your plans and practical for your pocket. Chances are, we’ve already worked in your building and are familiar with the guidelines and challenges that New York City remodelers face. Knowing how to navigate through your building’s guidelines helps us move forward quickly and efficiently. Above Remodeling goes above and beyond to ensure that every construction project – small or large – is completed within the time frame and budget that works for our clients. We specialize in New York City apartment renovations, but we’re also pros when it comes to urban and suburban house renovations. From consultation and budgeting to scheduling and material acquisition to filing of permits and licenses, Above Remodeling is full licensed and insured and handles all aspects of services for your project. The BuilderTrend feature on our website is designed to keep you up-to-date as we work on your bathroom renovation. 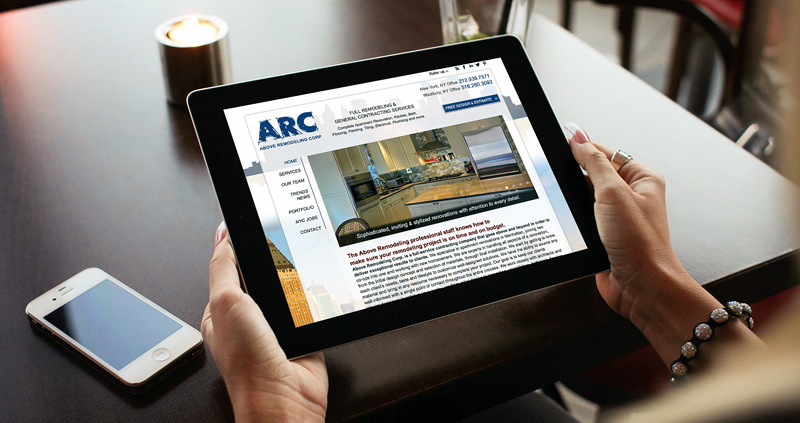 Our website, Facebook and Instagram pages show some of our latest New York City apartment renovation projects, team news and the newest trends in remodeling and renovation. We are experts in bathroom remodeling, kitchen remodeling, bedroom suites, entire home renovations and remodeling to join co-op apartments together. If you work at home, you may need a private area with utility space with customized workspace counters, shelving and lighting so you can work more efficiently. We can do that! If cooking is your passion, we can steer you toward the best configuration, most efficient appliances, task-friendly countertops, customized cabinetry, proper lighting, flooring and backsplash for your kitchen. Visit AboveRemodeling on social media to see renovation styles, and closeup photos of interior details, appliances and finishes that make all the difference in your relationship with your home. Contact us with any questions about your upcoming project or to arrange a free apartment renovation consultation and estimate. Above Remodeling can work with your to create the most luxurious bathroom that your space will allow. We know that every project is unique. That’s why we tailor our work to fit your specific remodeling needs. Our complete, all-inclusive service takes care of all the planning and eliminates many of the biggest challenges. We take care of all the leg work, including demolition and clean up, to the final layer of paint. We help to make your remodeling vision a reality. Contact us to get started. This contemporary master bathroom features a dark dual vanity cabinet , glass walk-in shower, drop-in tub and open cabinets filled with shelves. 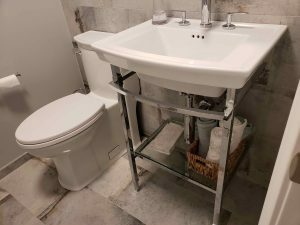 If you are getting ready for a bathroom remodel in your house or New York City apartment, remember that there are many traditional and non-traditional approaches ranging from a full renovation to simply upgrading existing items. These upgrades include changing hardware such as replacing fixtures, or even changing tile, wallpaper and paint. If changing the existing hardware and appliances isn’t enough to breathe new life into your bathroom, a popular option for homeowners is to remodel existing elements. If you are looking for a simple visual improvement and impact, a remodel of the flooring can do the job and change the entire theme. If you are looking for a more functional change, replacing an old toilet, dated hardware and dysfunctional cabinets may be in order. These changes can improved utility and add a lot of serviceable space – a big consideration for apartment dwellers. Above Remodeling has put together 8 topics for your to think about so you to get the most out of your bathroom remodel. Replace an older bathtub with a new model, or by remove the bathtub all together and opt for a walk in shower. Walk in showers are an excellent way to change the entire look of your bathroom. 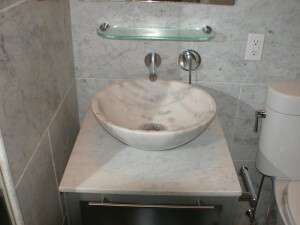 Bath tubs are a staple for most bathrooms and are usually the centerpiece. Replacing bathtubs entirely for newer and better looking models is generally a good idea but in recent years home owners have started to simply replace old hardware on tubs. Changing knobs and fixtures is a great way to improve the look of any tub. If you are in the market for a new bath, consider models that can be upgraded to include sliding doors or other elements that you may want later. When upgrading your bathroom, homeowners should always make sure that their new bath choices meet their space requirements and will mate with existing plumbing. New counter tops can drastically change the look of your bathroom since they are usually the first thing people notice when first entering. Impressive counters can draw attention away from some of the less beautiful parts of your bathroom. Replacing an old synthetic plastic counter with stone, or stone veneered, tops will give a more earthy appearance. Replacing the counter with colored tops will allow you to match colors elsewhere in the bathroom. Mirrors are one of the most used but yet overlooked items in a bathroom. 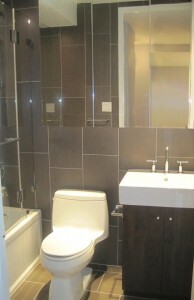 Upgrading your existing mirror can be an easy change. While the mirror itself can be replaced, simply adding a trim frame around it can be enough to make an old piece look new. Of all places in any home, bathroom lighting needs to be multi-operational and among the most well-lit considering that the bathroom is where most people start their day. Bright LED day light fixtures flanking a bathroom mirror are ideal for grooming and makeup tasks. Additional lighting where density can be controlled with dimmer switches can create a soft ambience for relaxed bathing. Upgrading your flooring is always a great way to change the look and feel of your bathroom. If you are currently using a linoleum floor, consider moving to a tile or hard wood floor. Tile is a great option due to its water resistant nature, and can give a more regal feel to your bathroom. While hard wood flooring is not traditionally considered for this type of renovation, in recent years composite materials that mimic the appearance of wood have become popular options. These composite materials are water resistant, and can give a unique and more natural look to your room. 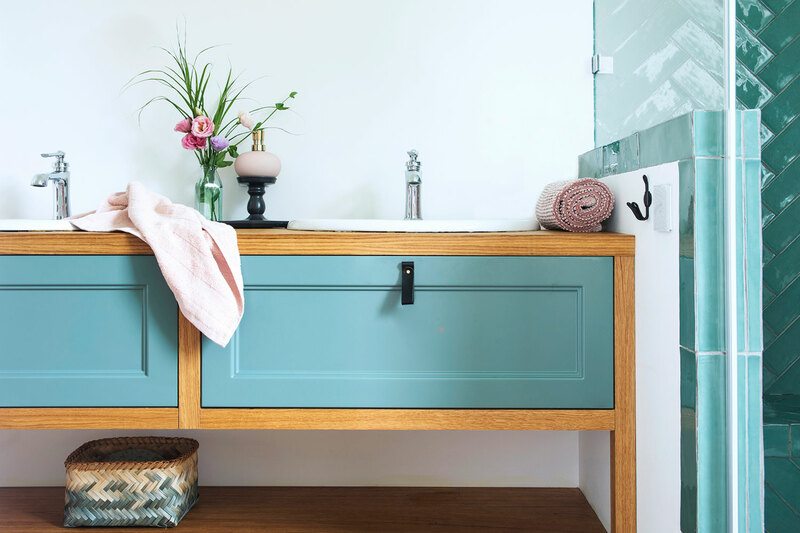 Cabinet upgrades are a great way to re-imagine any bathroom. Most bathroom cabinets are built from ply or particle board and then coated with a wood grain veneer. This veneer is not always water resistant, and condensation buildup can cause the veneer to slowly degrade. A great remedy to avoid this problem is to install well-built models made from a solid wood which will last longer and potentially avoid water damage. Tile backsplashes and walls can add a lot of drama and style to a bathroom, but also will add quite a bit to overall renovation costs. Unique shapes, colors and materials like glass and organic stone can substantially change the mood. If you’re looking to freshen your bathroom with a new paint job, today’s overwhelming amount of color choices can be daunting. Neutral tones with organic undertones, while very popular, can also be the most satisfying not only for the mood but for longevity. A bold accent color can be introduced on one wall that can be easily be “swapped out” for a later refresh. Above Remodeling can create the bathroom you have always wanted.